Tetbury Goods Shed Arts Centre is quickly establishing itself as a vibrant arts venue in the Cotswolds. The Shed is run almost entirely by Volunteers, and we take a huge pride in the venue and its events. We welcome new volunteers, and value any time or skills that you can offer. Whether you have just an afternoon, a regular day, or an occasional weekend, we can find a role for you within our team. Whether it be helping in the bar, box office or café, delivering leaflets, restoring our splendid Finnish Railways broad-gauge carriage, offering project management or financial skills, or technical expertise, we have a space for you. If you would like to find out more, please contact us – we would very much like to hear from you. If you would like to be contacted by Jennie or Christine, our volunteer organisers, please enter your details below and they will get in touch. PS. 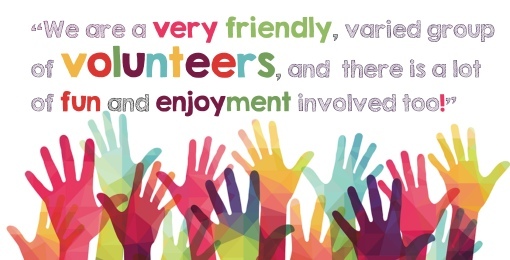 We are a very friendly, varied group of volunteers, and we ensure there is a lot of fun and enjoyment involved too! To get involved as a volunteer, send us your details via the form on this page, or call the Shed Office on 01666 505496. Or email the administrator at office@shed-arts.co.uk. Or please just call into the Shed when we are open.